If you are building a web application or a website which requires an Admin section, you can save yourself many hours of development time by using a Free Bootstrap Admin Template. Bootstrap is the excellent framework created by Twitter which helps to speed up the process of creating websites by providing CSS and JS which can be used within it – you don’t have to manually code each element over and over again for different projects. There are a large number of Admin templates available and a great number of free ones to download, which is why we have put together this collection – on this list are over 30 different items which you can use in your projects. They typically include things like a dashboard page, graph / chart libraries, buttons, alert boxes, icons, tables, navigation schemes and so on. Take a look below and choose the perfect one for your project. 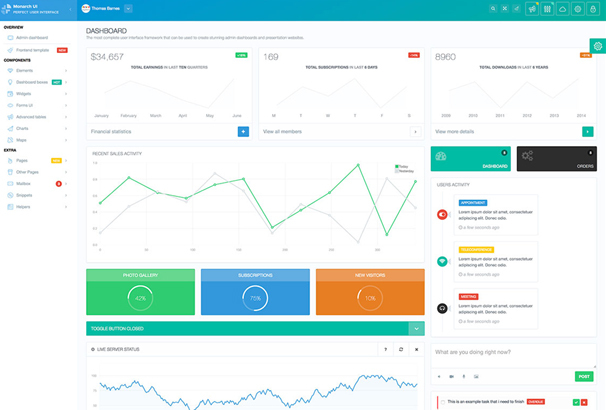 This is a modern and clean, flat bootstrap admin template. This designed ready template is completely flexible and it supports most of the devices. It is based on Bootstrap v3.3.4 and Html5. It contains amazing charts and graphs which will help you to fit with all kinds of requirements of an admin template. 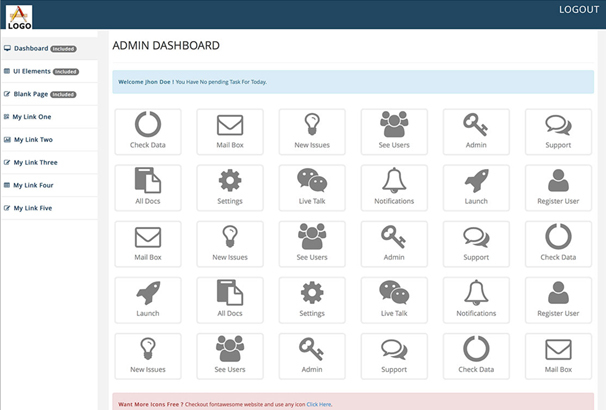 This is a free admin template with a horizontal layout. This template developed with clean code and very easy to customize and edit. There are lots of features including in the admin template such as font awesome icons, built-in login page, responsive design, and bootstrap framework. 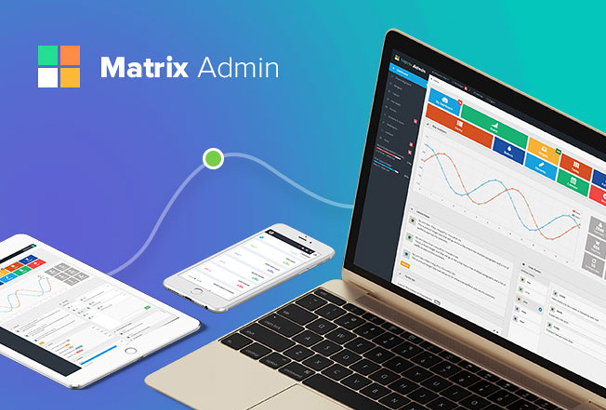 Matrix admin template is one of the best bootstrap based admin templates. It has almost 22 pre-made pages and too many options are included with this theme. Features: Responsive layout, Collapsible Menu, Valid HTML5/CSS3, Progress Bars, Button Drop Down, Nav Bar, Breadcrumbs, Labels & Badges, Modal Window, Tooltip Tables (Static & Dynamic), Graphs & Charts Simple Chart and much more. 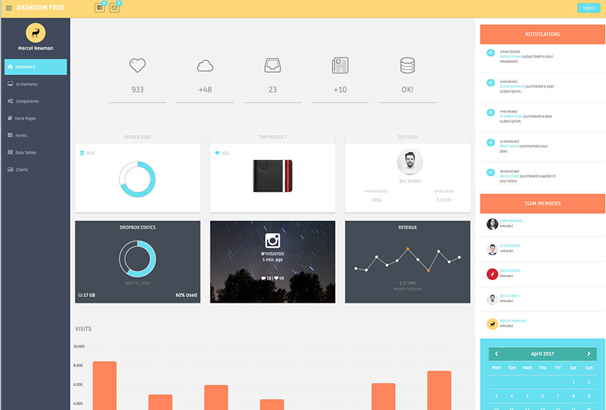 Paper dashboard admin template has soft colors with beautiful typography and spacious cards and graphics. This is a light but powerful admin template. It has 16 handcrafted Components, 4 customized plugins and 4 example Pages in the freebie pack. 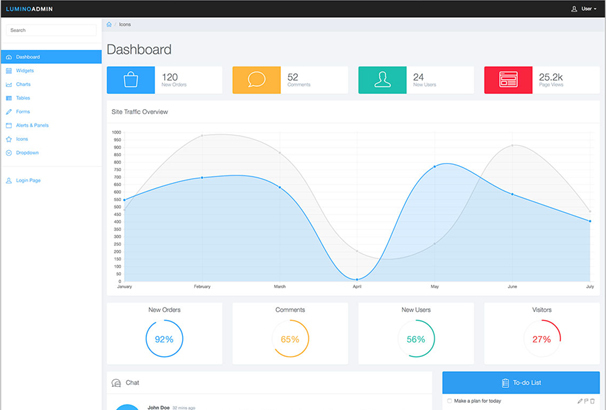 Bcome is a fully responsive bootstrap admin template. 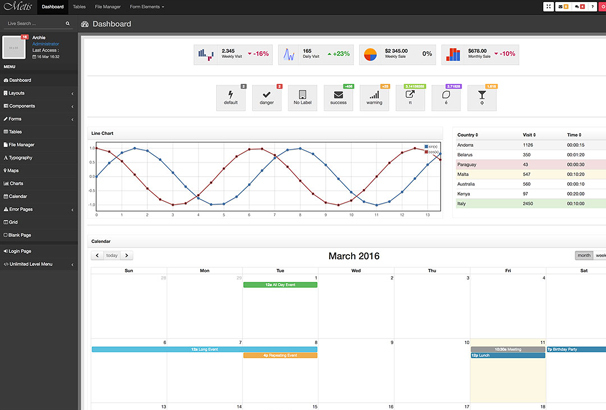 It has 40+ integrated plugins for charts, data tables, maps, notifications and more. This template is fully customizable and designed to work well on desktops, laptops, tablets and mobile phones. 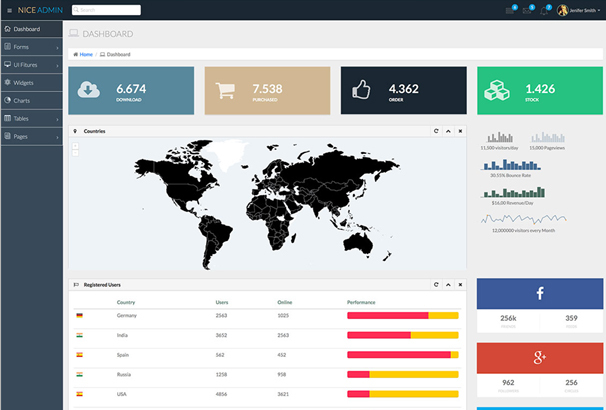 If you are looking for an exclusive dark color admin template, then you are on the right page. It has lots of features such as a powerful dashboard, portfolio page, Signup page, register page and much more. You’re allowed to download if for free and use it for any types of personal or commercial projects. 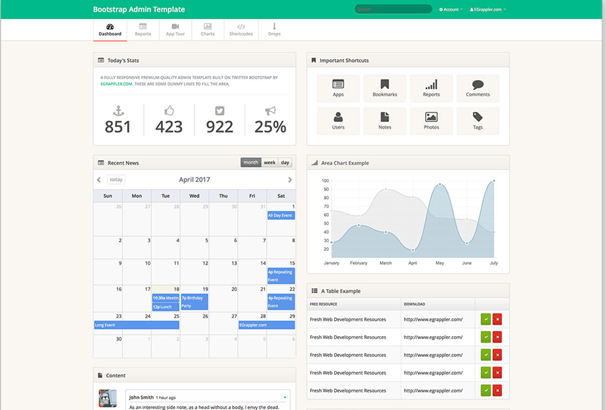 This is another exclusive responsive admin template. You can use this admin template for personal and commercial projects and it includes the latest font awesome icons and latest bootstrap. If you have started projects and looking for a simple, responsive admin template, then this template is a good one to start with. 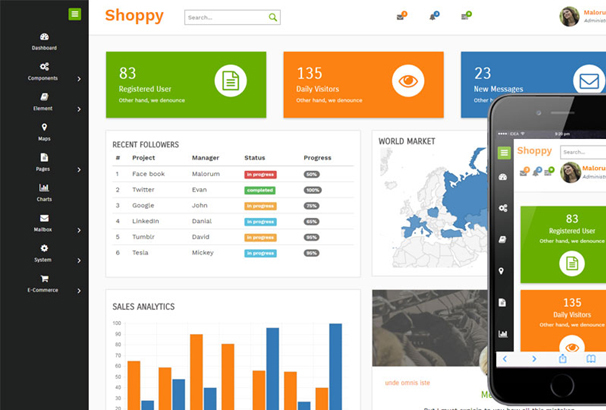 Shoopy is a flat and responsive admin template built upon HTML5, CSS3, and Bootstrap framework. By using this admin template you can easily build a powerful user interface within very short time. There are lots of plugins are added in the template such as navigation, Maps, Calendar, graph, charts plugins. 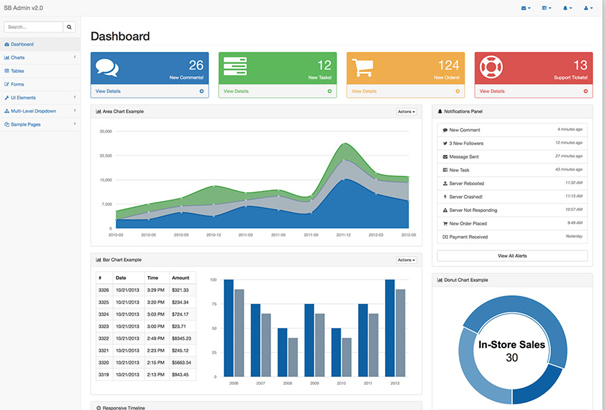 This is a responsive dashboard-style layout admin template that uses Bootstrap 3. You can use this template as a starting point to create something more unique. This template has a collapsible tree menu and a variety of panels that can be used as dashboard widgets. This template is based on Twitter Bootstrap 3 with Sass and Compass. This featured admin template is perfect for developing any types of user interface. This template is free to download and you’re allowed to use it for any types of commercial or personal projects. 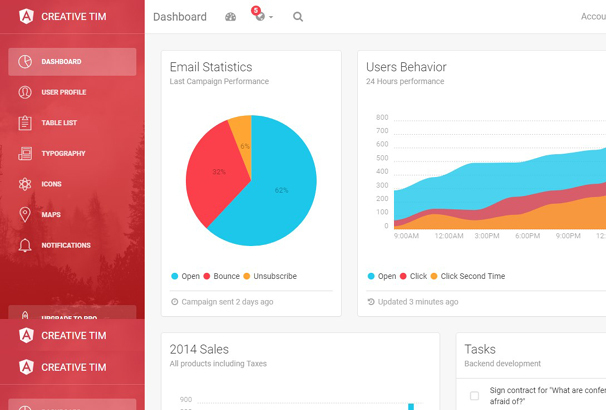 This is an amazing admin dashboard template inspired by Google’s Material design. This template is built over the popular Bootstrap framework and it comes with a couple of third-party plugins which will help you to develop a user-friendly interface within very short time. It has 60 handcrafted components, 2 Customized plugins, and 3 example pages in the free version. Laravel angular admin template designed to give you a base to start working with. It uses Laravel, Angularjs, Bootstrap, and Gulp plus features Oauth and JWT authentication, which is very useful for developing a user interface. You can download it for free and customize it as you wish. 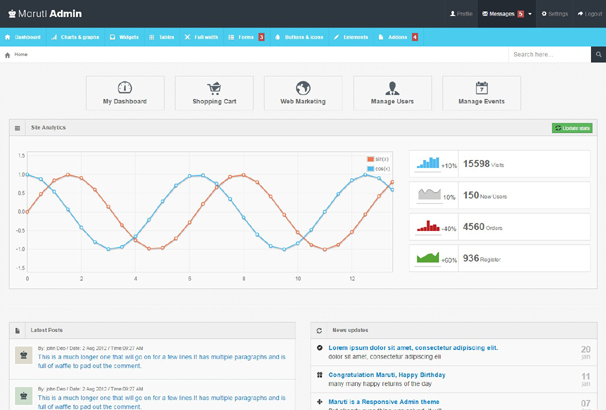 Devoops is a great featured Bootstrap 3 theme to jumpstart your next web application. This theme is built on Bootstrap 3 and free to download for all. 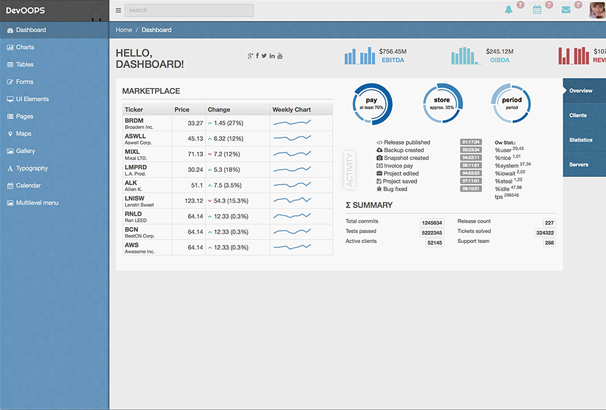 It has lots of features such as dashboard layout, xCharts, Flot charts, Google Charts, Morris Charts, Google Maps Integration, Multilevel Menu, Table Structures, Widget Elements and much more. This is another exclusive admin template features a variety of custom jQuery plugins to add extended functionality past the built in Bootstrap UI features. It has lots of pre-built features such as Responsive sidebar menu, jQuery charting plugins, Sortable, searchable, multi-page Bootstrap tables using the DataTables jQuery plugin and much more. 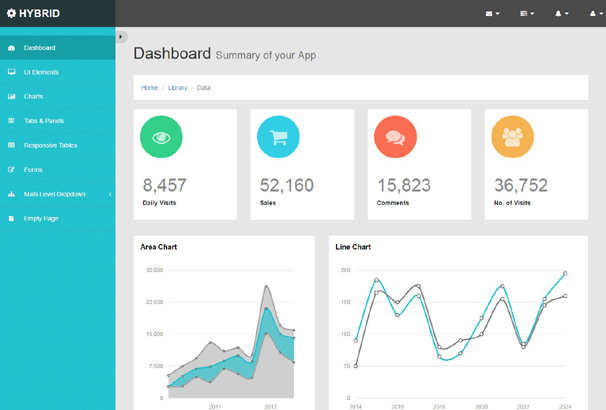 Ng2 is one the best web dashboard application based on Bootstrap and Angular 2. You can easily customize and develop user-friendly admin dashboards by using this admin template. This freebie was created and released by ranjithprabhuk. 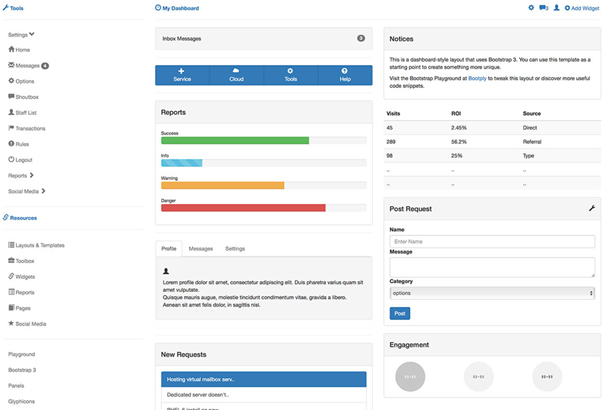 This is a fully responsive and free admin template based on Bootstrap 3. x framework. It also uses Google Material Design which will help you to create an amazing user interface within very short time. You’re allowed to use it both on personal and commercial websites/web projects. This exclusive freebie was created by gurayyarar. This is simple and elegant admin template. There are almost 15 pages are included in the freebie pack. It has amazing tables, menu panels, calendars, notifications, to-do lists, and charts. Feel free to download it. 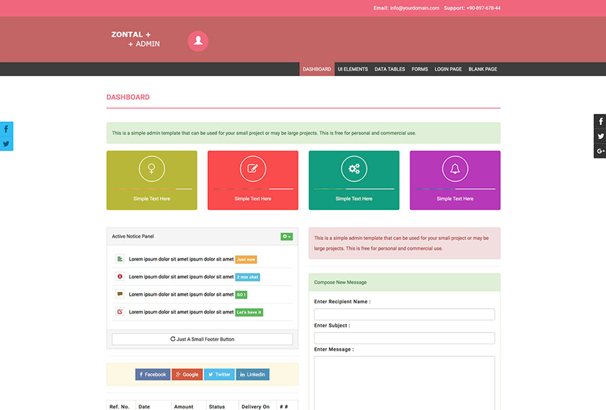 This generic admin theme built with Bootstarp framework. 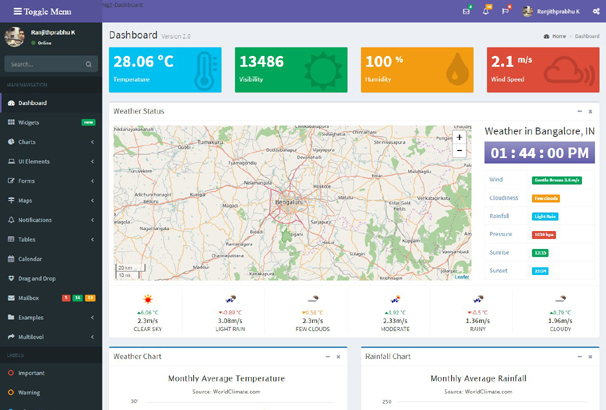 This template contains lots of elements such as pages Login page, sign Up page, admin dashboard, full Calendar, statistics & charts, buttons & icons, form & Wizard, form Plugins, tables & Bootstrap dataTables, UI & Interface Elements and much more. 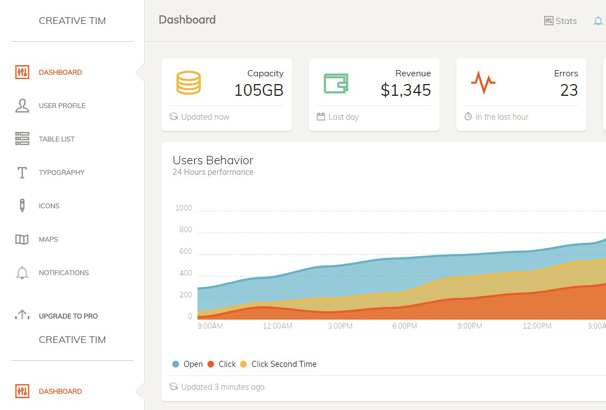 Delight is a clean yet powerful admin dashboard template. It was built using Bootstrap, HTML5, CSS3 and jQuery. It features many professional looking and easy to customize UI elements such as widgets, charts, mailbox, responsive charts, to-do list and much more. 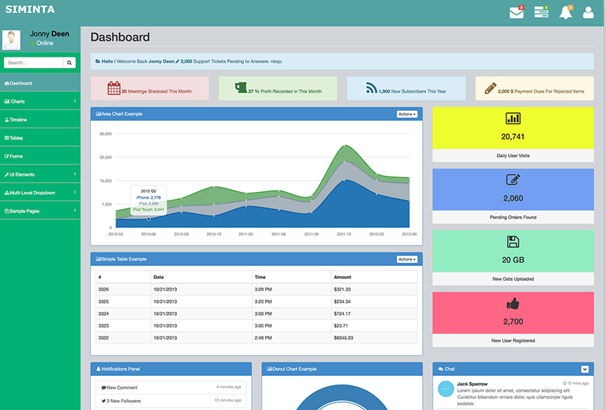 This is a powerful bootstrap admin dashboard template. You can use it for any app, service, software or anything else. 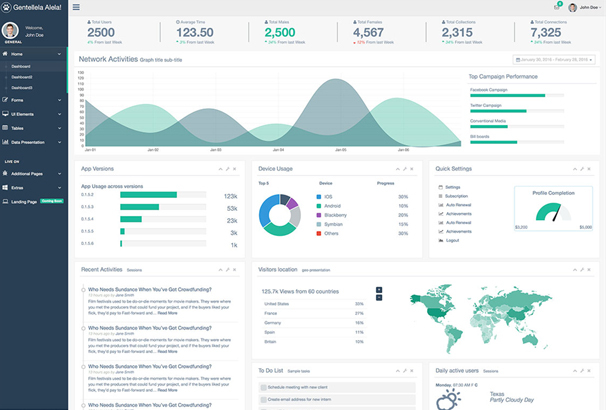 This powerful bootstrap admin dashboard template was created by puikinsh. 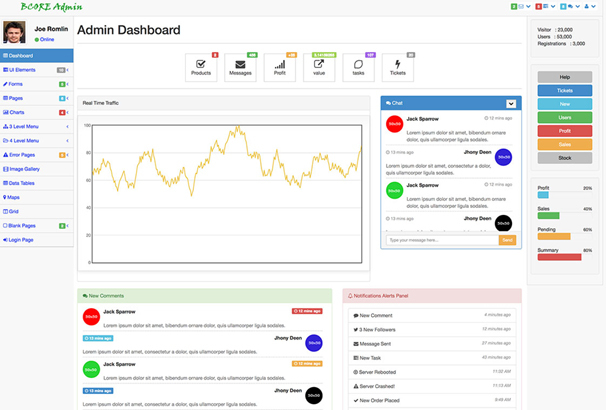 This is a reliable, user-friendly and easy to customize admin dashboard template. It comes with a huge collection of plugins and UI components that make your work easy. This admin template is 100% free to use for personal and commercial usage. This powerful bootstrap dashboard admin template developed by Creative Tim. It has lots of elements which will help you to create any app that best fits your needs. It is built on Bootstrap 3 and it is fully responsive. It has 16 Handcrafted Components, 2 Customized Plugins and 4 Example Pages. 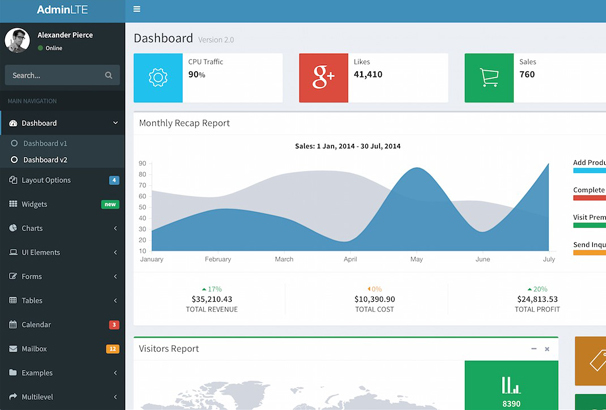 If you are looking for a handcrafted dashboard admin template, then you are in right place. It contains 7+ unique demo, 3+ unique dashboard interface, 500+ UI elements, 600+ page templates, 3000+ font icons and eye-catching landing page. The template is completely free to download and use for your personal projects. 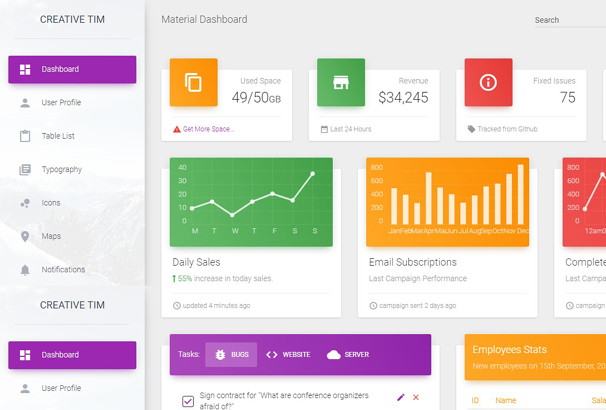 This powerful admin panel template is built on the Bootstrap framework. It contains dashboard overview page, various widgets, responsive charts, advanced data tables, forms, UI elements and sample login page. You can download this admin template for free. 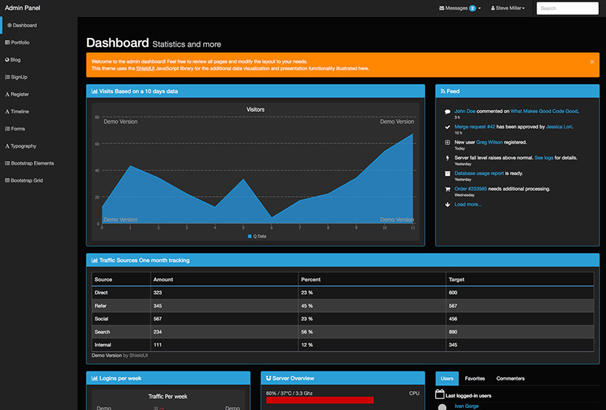 This is another popular open source WebApp template for admin dashboards and control panels. It is a responsive HTML template that is based on the CSS framework Bootstrap 3. It utilizes all of the Bootstrap components in its design and re-styles, many commonly used plugins to create a consistent design that is very useful for backing applications. Maruti admin dashboard template made with a clean and minimal design concept. There are lots of pages included in this template such as login Screen, homepage, Chart, Cha, Interface Element, Grid, Table, Basic Forms, Forms with Validations, Forms with Wizards, Gallery, Calendar, Buttons and Icons, Widgets and much more. 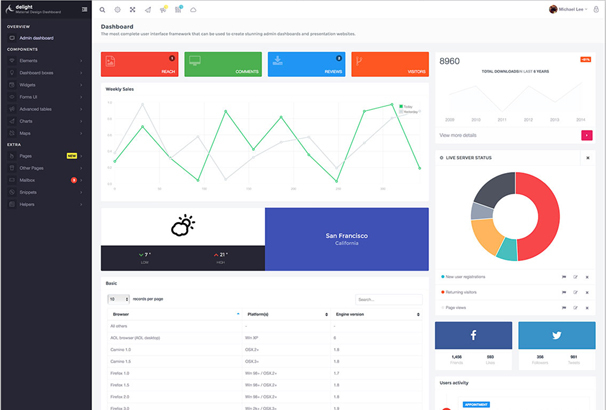 Monarch is a clean and minimal admin dashboard template using Bootstrap, HTML5, CSS3, jQuery and Angular JS. There are several responsive chart libraries included such as flow charts, sparklines, piggies, justgage, and Morris. It features many professional looking and easy to customize UI elements such as widgets, charts, mailbox, chart, to-do list and much more. 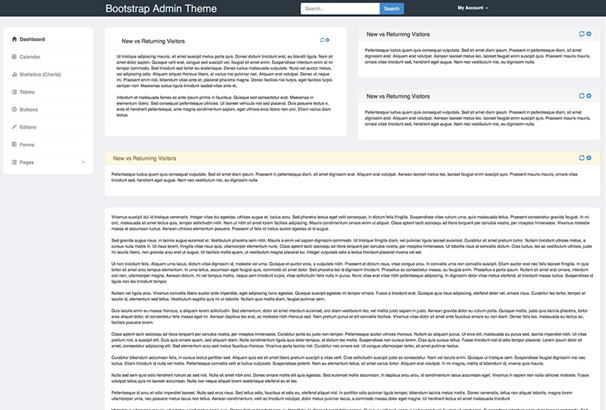 This is a free bootstrap admin template. 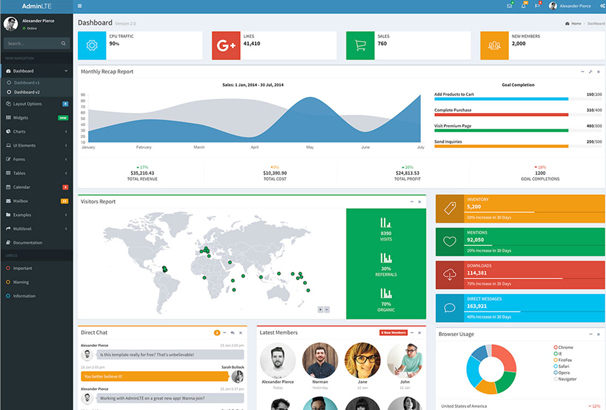 This admin template uses several libraries which will help you to create an eye-catching user interface or standard back-end dashboards. 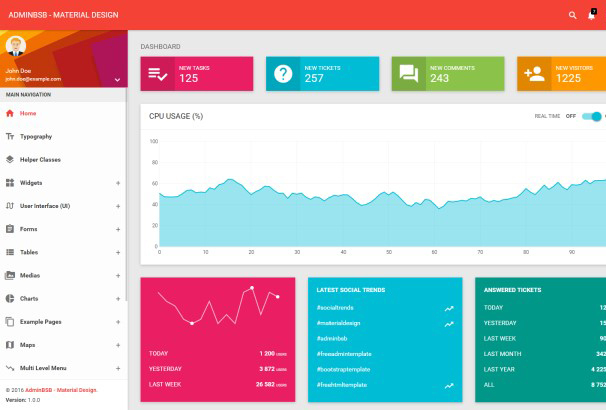 This powerful admin template is based on Bootstrap framework. It is mainly focused on user experience and perfect for all devices such as tablets and phones. You’re allowed to download it free and customize it to your needs. Thanks for the collection of Admin templates – perfect for what I was looking for. Gentellela is kinda outdated template… still a free one and works perfectly. AdminLTE is easy to use and works well too.